Our technical experience will save you time and money. 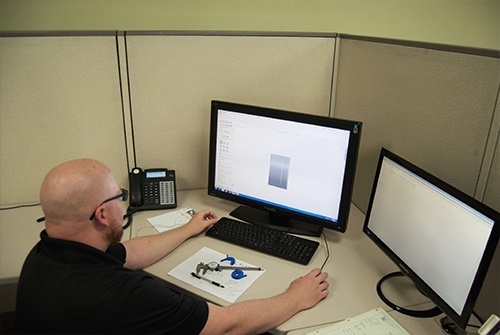 Our engineering and technical staff are here to help you make the decisions that will make your small plastic part product a success. They can help you understand the tradeoffs between tooling and manufacturing costs and identify where you may have unnecessary costs in your small plastic part. We begin the process by discussing the scope of your project along with your specific needs. This is followed by a more in-depth consultation with one of our engineers. Their expertise will get you into production with fewer iterations so you can start selling product sooner. Throughout the project we implement our quality control process that practices efficiency in order to save you money. No matter the project scope, we know that high quality plastic parts are important to your success! Outside toolmaking, guaranteed by us, gives you the best balance of skill, cost, and delivery. Our leadership includes two mechanical engineers and a tool maker while our production staff draws from the most experienced men and women in the plastic industry. Each one of our employees is knowledgeable and highly capable of even the most demanding designs. While the one-stop shop used to be considered the way to go for design and production, we’ve led the way in a new, more project-specific approach that allows our customers to take advantage of the very specialized expertise of different toolmakers. No more getting stuck with a toolmaker that isn’t a good fit. In selecting a small plastic part specialist, you avoid the higher overhead and extra costs of generalists. We're experts in small part plastic production and custom plastic injection molding. Because we are a very specialized plastics molder, making parts with tolerances of +/- 0.001", manufacturing pieces with holes the diameter of a hair, we are used to approaching every project with a refined eye and high attention to detail. This specialization also lets us devote more time to your demands, allowing us to exceed expectations in both budget and timelines! We also make unique custom plastic parts like overmolded sealing components that protect electronic components from water submersion. A "full-range" molder doesn't have our focused skill set, the small plastic part efficiency we bring to your project, or the ability to produce large quantities of the highest quality plastic parts at very cost-effective prices. As experts in overmolding, insert molding, and metal replacement, we are already experienced in complicated specialties. When overmolding and insert molding are done well, the results have an elegant simplicity. But getting to an impressive finished product can be challenging. We have extensive experience in these specialties and know how to fine tune a process to ensure you get exactly what you're looking for. If you’re looking for incredible attention to the finest details, technical experience throughout the development of your product, and flexibility within your current and future orders, AIM can give you what you need. We are big enough to deliver but small enough to take a personal interest in your success. Our company is open and running our 32 presses 24 hours a day, 7 days a week, continuously working hard to satisfy our customers. This means we are able to handle large project loads with the same quality you would expect from a small shop. Many of our customers could have their pick of vendors worldwide. They choose AIM Processing for our production capabilities and a level of responsiveness that is lacking in many larger operations. When the unexpected happens — a large unplanned order, a shortage of just a few parts — they know we'll go out of our way to help them. Whether it's stocking some extra parts for quick fulfillment or rescheduling a production run, we do what it takes to ensure they can meet their commitments.